Deduplication technology is essential to every company’s data backup process, especially when it comes to managing big data. It is designed to eliminate redundant data in a storage system, and reduce the amount of data that must be stored as a backup. When it comes to data security, deduplication is the fastest way to generate a return on investment because it enables an organization to decrease the amount of storage to buy and maintain. Can source dedupe or target dedupe from your backup application meet your needs? That will depend on your organization’s backup environment. Check out the descriptions of each type of deduplication below to decide which function is best suited for your organization. As the name suggests, source deduplication occurs at the source or at the server or application layer. This type of deduplication is best suited to use at remote offices for backup to a central data centre or the cloud. It is also an ideal backup solution for environments with a low daily data change rate. Source deduplication is considered the slower of the two functions because it creates additional workload for the client device. Target deduplication takes place after the source has been backed up, at the target storage location. Since target deduplication provides faster performance for large data sets, it is typically used by large companies and fewer bandwidth constraints. Unlike source deduplication, target deduplication does is usually carried out with a hardware appliance. Target deduplication is a great way to enhance existing tape based backup infrastructures due to its simple integration with existing backup applications. The initial backup at the source can be completed more quickly by moving CPU-intensive deduplication off the source machine, shortening the backup window. It provides an easy starting point for organizations interested in reducing backup windows, enhance data protection, and increase productivity in the data center without making significant alterations to their backup environment. If your company is not already utilizing data de-duplication in your backup and recovery process, now is the time to consult a vendor that offers it as feature within their appliance. The new NetBackup Intelligent Deduplication architecture in NetBackup 7.6 delivers faster, more resource-efficient, and more reliable deduplication performance. Included in the update is a self-healing architecture that further extends and maintains data integrity. 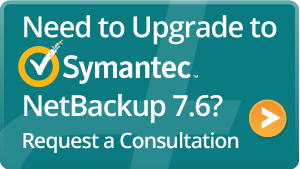 If you are interested in learning more about Symantec NBU 7.6, and its other great capabilities, click the button below to request a consultation with Dewpoint.